Mike Harrington: Buffalo Sabres forward Johan Larsson returns to the lineup. 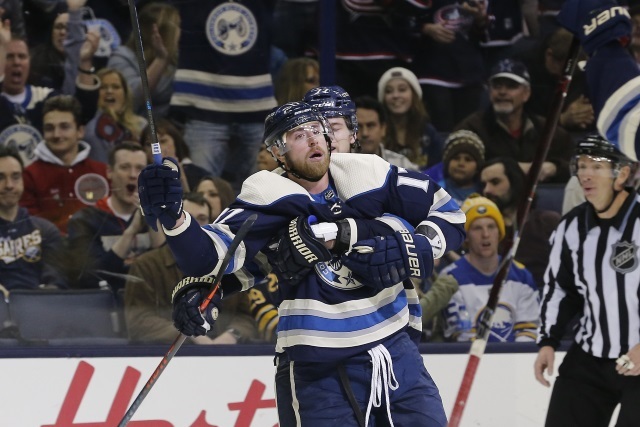 Mark Scheig: The Columbus Blue Jackets sent forward Brandon Dubinsky home to get an MRI done on his hip. He is finished for the rest of their road trip. Renaud Lavoie: Montreal Canadiens forward Michael McCarron will have surgery on his left shoulder and is done for the season. Eric Engels: Canadiens forward Paul Byron didn’t practice – day-to-day with a forearm injury. Abby Mastracco: The New Jersey Devils have activated defenseman Ben Lovejoy off the IR and he returned to the lineup. Andrew Gross: New York Islanders coach Barry Trotz didn’t have an update on Cal Clutterbuck. Andrew Gross: Both Andrew Ladd and Thomas Hickey were on the ice but there is still no timetable on when they could return. Murray Pam: Ottawa Senators Jack Rodewald will be out for two weeks with a lower-body injury. John Boruk: Philadelphia Flyers goaltender Brian Elliott could return to the lineup sometime next week according to coach Scott Gordon. Brian McNally: Capitals defenseman Christian Djoos is back with the team and is “an option” to play on Saturday according to coach Todd Reirden.